A historical researcher provides knowledge to help you better understand the present and move forward with greater confidence. The historical researcher therefore needs to meet your expectations. Many never have the need of a historical researcher. Appointing one can be, at first, an unsettling prospect for some. As a professional historical researcher it is my duty to be aware of these sensitivities. I work respectfully with you on your project to understand the core objectives. The expertise of my research skills as a historical researcher are then deployed to fulfill your requirements. I can deliver the project in a format that suits your needs. I can write a report, take digital photographs, undertake some interviews or add content to your website. Please contact me here as soon as you would like to discuss the piece of historical research you would like to start. 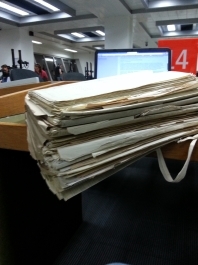 There are no limits to the size or type of project that I work on as a historical researcher. Neither is there any difference in service between individual clients and organisations. Each enquiry is important for me because the content is equally important for each client. It is often the case that I help embellish some solid research that already exists or start a fresh project. My role as a historical researcher can be combined with that of a archival digital photographer. I can be commissioned to undertake a role as part of a funded project. I am happy to coordinate with multiple members of an organisation to share the research material. I can attend meetings regularly of your organisation to update members on progress. It is my pleasure to speak publicly about the research at an event on behalf of an institution. I am also happy to assist with any administration related to the research, particularly liaising with bodies to release funding. In 2015 Dr Hywel Maslen was appointed as a historical researcher to work on the Heritage Lottery funded project for Uppingham Town Council to research and develop a website for their Uppingham Heritage Trail; a sign-posted walk through a picturesque working town in the county of Rutland. My work involved me travelling across the United Kingdom to conduct research for a number of items on the heritage trail at a number of archives, record offices and libraries. Have a look at the website for Uppingham Heritage here.